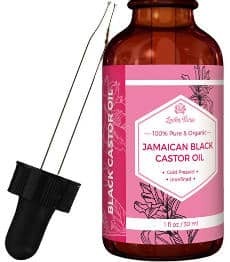 If you have been looking for the perfect oil to keep your hair and scalp healthy and your hair growing, then finding the best Jamaican black castor oil for hair can be the answer to your hair and scalp problems. 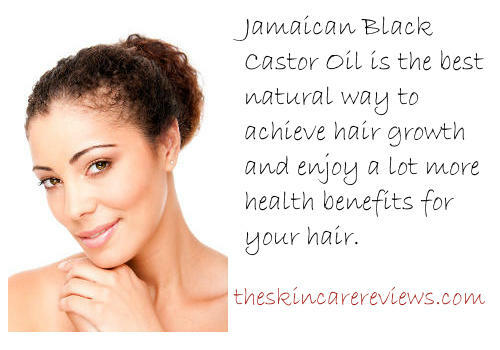 Jamaican Black Castor Oil reviews are rave as this product really seems to make a lot of difference in increasing people´s hair growth naturally as well as providing other healthy hair benefits that make users enthusiastically review this product and one hundred percent recommend it to other people facing the same issues as them. Being myself an avid user of Castor Oil and totally appreciating its benefits for my skin in terms of moisturizing and fighting wrinkles, I am totally sure that Black Castor Oil is not another over estimated product for hair and skin but it really has a lot to offer and all this in a complete natural and cost effective way. Jamaican black castor oil is different from clear castor oil in that the castor oil beans are roasted instead of cold pressed. For years, black castor beans have been used to help treat wounds and reduce dark pigmentation as well as the appearance of stretch marks, scars and wrinkles. Because it is rich in vitamin E and omega 6 fatty acids as well as other nutrients, it is well known to increase hair growth, help hair to grow longer, thicker and stronger, moisturize as well as deeply condition hair and scalp, minimize and prevent hair damage but also make hair softer and shinier. If frizz is your type of problem, this natural oil can not only prevent frizziness but also split ends and other types of hair damage. Finally, some people have reviewed that Jamaican Black Castor Oil has helped them get rid of their dandruff naturally. Overall, what users experience after using it is increased hair growth as well as healthier hair and scalp. Since Jamaican Black Castor Oil is great for hair growth as well as hair strengthening, people not only use it on their scalp and particularly on those areas that they have hair falling or thinning but they also use it to thicken and grow their eyebrows as well as their eyelashes with excellent results. Some people have also used this oil for beard growth with positive results but keep in mind that if you are growing a beard and you are using Jamaican Black Castor Oil to boost its growth but you have not experienced such great results as you expected, this oil is still perfect for moisturizing your skin under the beard and conditioning the facial hair that you are growing to make it look healthy and good looking. Other possible uses of Jamaican black castor oil that are mentioned include helping with sunburn, eczema, stretch marks, wounds, scars and burns as well as brittle or damaged nails. First, keep in mind that this oil is not runny but it is thick so you don´t need to use much. The most common way of using it is to massage a few drops into your scalp a couple of times a day. Here I have to say that a lot of the Jamaican Black Castor Oil user reviews have emphasized on how important it is to be consistent when using this oil in order to have the desired results. With a consistent use, people do experience fast hair growth and healthier as well as fuller hair among other benefits. Other ways people use this oil is to transfer it into a mascara container for an easier application on their eyelashes or even eye droppers for a more controlled use of the quantity they need to use. By this time, you must have had a good idea of the benefits this oil has on people´s hair and skin but let me shortly refer to them once again. The advantages of using this oil is about its effectiveness in terms of making your hair or thinning edges grow back, your hair getting thicker, fuller and healthier as well as you experiencing a better conditioned scalp that does not flake or get dry. Jamaican Black Castor oil is also good for moisturizing the skin and helping it deal with aging signs. A little of this natural product goes a long way and its price is a total deal. A lot of the users have mentioned that they don´t feel so thrilled from the kind of smokey smell this oil has but, still, for the benefits it offers, they are willing to forget about it. Here, I would say that this oil is obviously a totally natural product and therefore it has a natural smell, which means that no synthetical fragrances are added to it, which is great if you really want to benefit your hair and skin´s health with a pure Jamaican Black Castor Oil and not with a fragranced product that has absolutely no health benefits for your hair and might even irritate your scalp. Another thing you need to keep in mind is that for a few people, this oil might feel strong if applied undiluted on their scalp. In that case, you can mix it with a good carrier oil that is good for hair such as jojoba Oil, Argan Oil or Maracuja Oil. Also, if you are allergic to nuts, you need to first consult your dermatologist or physician before buying it. This Tropic Isle Living Jamaican Black Castor Oil is an extremely popular among users product that comes in a 4 ounce bottle. It promises to help grow and thicken your hair as well as prevent or mend hair damage. Users really like this thick black castor oil and find that not only it is great for re growing and thickening hair, but is also perfect for eyebrows and eyelashes. They also state that it really moisturizes the scalp making it healthier. Several users have mentioned that it has improved the length of their hair and prevented both hair breakage and hair loss. Some people combine it with other oils while others use it on its own. Finally, almost all people who have tried this product and reviewed it stated that their hair retained more moisture and was left shining. Leven Rose is a well known American company specializing in creating top quality natural oils, so it was no wonder for me to discover that they are also offering a pure Jamaican black castor oil. This is free of additives, fillers, GMOs, parabens as well as fragrances and is vegan friendly. It is also hexane free and has been minimally refined. It comes in a 1 fluid ounce dark amber glass bottle with a glass dropper for an easy application. User reviews for this natural oil are very positive. Among its plenty of benefits, users mention that it stops their hair from shedding and relieves scalp itch. They also use it to thicken thinning eyebrows. Many users mix it with their conditioner or use it as a hot oil treatment. It really moisturizes both their hair and scalp. Finally, this product is followed by Leven Rose 100% money back guarantee. 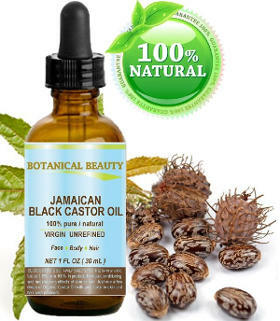 The Botanical Beauty Jamaican Black Castor Oil is a natural unrefined product that comes in a 1 fluid ounce bottle. The company promises to add moisture to your hair and scalp while thickening and strengthening hair strands. Users find this oil to be of a great quality and do state that it helps to thicken and grow their hair, eyebrows as well as eyelashes. Several reviewers have mentioned that their hair feels silkier, softer to the touch and shinier while some others have said that it helps to treat scalp eczema, dandruff as well as dry and itching scalp. This Paradise Oils Jamaican Black Castor Oil comes in a 16 ounce amber bottle and promises to rejuvenate dry scalp while strengthening your hair strands. It contains castor oil as well as black tea, which is added to give a better smell. Users report that this black castor oil leaves their hair soft, shiny and easy to untangle. They love the size of its bottle and feel that using it regularly results in thicker and stronger hair that retains moisture longer. It also helps to heal split ends and other damage. This Jamaican black castor oil comes in a 4 ounce brown/amber bottle and promises to promote a healthy hair and scalp while relieving dry scalp itching. Apart from Castor Oil, it contains soybean oil, coconut oil, carrot oil, sunflower seed oil and grape seed oil. What I don´t like about this product is that, according to the ingredients list provided, it also contains fragrance. Fragrance is an additive that can irritate sensitive skin and it does not have any health benefit apart from the fact that, to some people, it might give a more pleasant smell to the final product. Also, since this oil is mixed with so many different natural oils, I have my doubts of what the percentage of Black castor oil is and whether it is enough to provide people with all those benefits that plain Jamaican Black Castor Oil has. Nevertheless, user reviews are very good. People say that the texture of their hair has improved since they started using this oil and they have also experienced more manageable and softer hair. Both women and men with natural hair review that it leaves their hair looking great without feeling overly greasy and they really like the fact that it moisturizes their scalp efficiently. People use this oil by itself or add it to their conditioner and use it as a hot oil treatment. In conclusion, after providing you with some useful information about Jamaican Black Castor Oil and giving you an idea about the best Jamaican black castor oil for hair reviews, my final conclusion is that this is a natural oil that you are surely going to love using and enjoy its benefits like so many other people that swear by its effectiveness for their hair.